Mariners slugger Nelson Cruz not only plans to keep playing in 2019, but Fancred Sports’ Jon Heyman reports that Cruz has hopes of landing a multi-year contract as a free agent this winter. Cruz will be an interesting test case within a market that has been increasingly unkind to veteran bat-only players over the last two offseasons. He turns 38 tomorrow and his list of suitors is almost surely limited to American League teams since Cruz has become a full-time DH. On the plus side, Cruz is still hitting as well as ever, with 21 homers and a .273/.358/.569 slash line through 288 PA. Teams are increasingly preferring to rotate several players through their DH spot rather than employ a full-time designated hitter, though Cruz’s production has been so excellent in recent years that you’d think at least a couple of clubs would be willing to trade lineup versatility for a big bat. The Athletics are getting calls about their relievers, as a scout tells Peter Gammons (Twitter link) that Blake Treinen, Lou Trivino, and Ryan Buchter have all drawn interest from multiple teams. Treinen has been mentioned as a potential trade chip, though Gammons says that Oakland has declined all offers for the closer. Treinen has two more years of control remaining via arbitration, while Buchter has three and Trivino only made his MLB debut this season. The A’s would surely need quite a bit to part with any of the trio, though a trade isn’t out of the question if the team is considering buying at the deadline. The A’s still have a big deficit to make up in both the AL West and wild card races, though an 11-2 run in their last 13 games has given them an impressive 45-38 record. With the Rangers facing a lot of uncertainty with their starting rotation in 2019, Jeff Wilson of the Fort Worth Star-Telegram suggests that Yovani Gallardo could potentially return to the team next season. Gallardo hasn’t shown much in three starts for Texas, though he would likely be a low-cost signing in the offseason and would give the Rangers some veteran depth as they juggle their various pitching options going forward. Right-hander Yu Darvish, out since May 23 with triceps tendinitis, is nearing a return to the Cubs’ rotation. Darvish will make a Single-A rehab start Monday and could head back to the majors thereafter, per Paul Sullivan of the Chicago Tribune. It’s not yet clear whether he’d bounce Mike Montgomery from the team’s rotation, as the lefty has performed well as a starter in Darvish’s absence and caught the attention of the Cubs’ front office in the process. Should Chicago choose to keep Montgomery and the walk-happy Tyler Chatwood in starting roles, it could go to a six-man rotation upon Darvish’s return. The Rockies announced that they’ve placed reliever Bryan Shaw on the 10-day disabled list with a right calf strain and recalled righty Yency Almonte from Triple-A Albuquerque. The DL placement continues a season to forget for Shaw, who’s in the first of a three-year, $27MM deal. Shaw has disappointed with his new club thus far, having recorded a 7.57 ERA with career-worst walk and home run rates (5.05 BB/9, 2.02 HR/9) over 35 2/3 innings. Athletics third baseman Matt Chapman, on the 10-day DL since June 15, won’t come back when first eligible, Susan Slusser of the San Francisco Chronicle reports. Chapman landed on the shelf with a right thumb injury, though team doctors now believe the problem area is just above his wrist, according to Slusser. He may need a cortisone shot as a result, and might not return until the A’s next homestand (June 29 to July 4). Meanwhile, the A’s are set to activate reliever Ryan Buchter from the 10-day DL on Monday, Slusser adds. The offseason trade acquisition has been dealing with a left shoulder strain and hasn’t pitched for the A’s since April 25. The Brewers will likely go without reliever Matt Albers until after the All-Star break, manager Craig Counsell told Todd Rosiak of the Milwaukee Journal Sentinel and other reporters Sunday. Albers is “going in the right direction,” though, Counsell noted. The 35-year-old has been out for just under two weeks with right shoulder soreness. Albers, whom the Brewers signed to a two-year, $5MM guarantee over the winter, has pitched to a 3.53 ERA with 7.85 K/9, 2.2 BB/9 and a 45.7 percent groundball rate in 28 2/3 innings. The Pirates have sent reliever Michael Feliz to the 10-day DL with right shoulder inflammation and recalled righty Clay Holmes from Triple-A Indianapolis, the team announced. The hard-throwing Feliz has endured a rough season in his first year with the Pirates, who acquired him from Astros as part of the teams’ Gerrit Cole trade over the winter. Feliz ranks second among Pirates relievers in innings pitched (32 2/3) and has struck out 10.74 hitters per nine, but a high walk rate (4.41 BB/9) and a low grounder percentage (30.7) have helped lead to a 5.51 ERA. Braves righty Julio Teheran left his outing today with what the team is calling “right upper trap tightness.” He had shown a concerning velocity drop before departing, as David O’Brien of the Atlanta Journal-Constitution tweets. The 27-year-old Teheran entered the day with a 4.00 ERA in his 27 innings, while carrying a career-best 12.8% swinging-strike rate, but gave up three earned in his three frames. It seems generally promising that there’s a muscular explanation for Teheran’s sudden loss of velo, though of course that does not necessarily mean he’s out of the woods and we’ll have to await further word. The Athletics have placed southpaw Ryan Buchter on the DL, per a club announcement. He’ll be replaced on the active roster by Danny Coulombe. At this point, the team plans to shut Buchter down for at least ten days and possibly longer, as MLB.com’s Jane Lee tweets. The 31-year-old southpaw, who was acquired over the offseason, has been quite good thus far for the A’s. He’s carrying a 1.69 ERA with 9.3 K/9 and 3.4 BB/9 over 10 2/3 innings. While the Giants will hold off on putting Mac Williamson on the DL, he’s in the concussion protocol at present, as manager Bruce Bochy informed reporters including Kerry Crowley of the Bay Area News Group (Twitter link). In the meantime, the organization has brought fellow outfielder Austin Slater onto the active roster, creating space by sending reliever Josh Osich to the 10-day DL. It’s unclear at this point how long Slater will have in the majors, but he’ll surely be hoping to follow the same track as Williamson, who kept on raking after receiving a promotion. Slater owns a .358/.435/.642 slash with just six strikeouts in his 62 plate appearances on the year at Triple-A. Blue Jays third baseman Josh Donaldson is beginning his rehab assignment tomorrow, as the team announced. He’ll open as a DH as he eases back into action, though the real test will come when he puts his throwing back on display at game speed. There’s similarly good news for the division-rival Orioles, who expect to send second baseman Jonathan Schoop on a brief rehab assignment next week, as Roch Kubatko of MASNsports.com tweets. He has been out for two weeks with an oblique strain. The Nationals, who are still waiting for a trio of important players, gave some updates today. (Links to the Twitter feed of Mark Zuckerman of MASNsports.com.) Third baseman Anthony Rendon is reasonably close and is expected to return in relatively short order after a brief stint on the shelf. It’s not quite as rosy for outfielder Adam Eaton, who has seemingly had some ups and downs in rehabbing his ankle issues, but — GM Mike Rizzo emphasized — also has not experienced any setbacks. As for second baseman Daniel Murphy, who has yet to play at all following offseason knee surgery, there’s still no timeline for a return. A number of other players are already coming off of the DL. The Reds have activated righty David Hernandez and the Mariners have brought back first baseman Ryon Healy. Both were relatively significant offseason acquisitions for their organizations. Meanwhile, the Rays activated infielder Matt Duffy and the Rangers did the same with righty Tony Barnette. The Royals and Athletics have agreed to a four-player swap. Left-hander Ryan Buchter and first base/DH-type Brandon Moss will head to Oakland in the deal, while right-hander Jesse Hahn and minor-league righty Heath Fillmyer are ticketed for Kansas City. The Royals also included $3.25MM in cash as part of the deal. Jeffrey Flanagan of MLB.com was first with the news. Though Moss is certainly the biggest name of the four, Buchter is actually the prize for the Athletics in this deal. In fact, the inclusion of Moss in the deal is probably more related to financial implications. Indeed, Royals GM Dayton Moore told Rustin Dodd of the Kansas City Star that “The economic part of it is very real to us,” which has in turn led to some speculation throughout the industry that the Royals are attempting to clear salary in order to make re-signing Eric Hosmer more feasible. Moore responded to an inquiry from Flanagan on the subject, telling him that it would be “inappropriate” for him to comment on a free agent right now. However, he did add that he’s been “very clear” about what the team’s thoughts are on Hosmer. Turning away from speculation and rumors and focusing on the here-and-now of the deal, the A’s will fill a bullpen need by getting a much-needed lefty. Prior to this trade, the only southpaw reliever in their projected bullpen was Daniel Coulombe. Buchter will serve as a long-term piece for the budding A’s (perhaps into their next window of contention), as he’s under team control through the end of the 2021 season. The Royals, meanwhile, will add a new potential candidate to their rotation. Per Moore’s conversation with Dodd, Hahn will compete during spring training for a spot in Kansas City’s rotation. Buchter’s a rare type of pitcher who’s been able to consistently out-perform his peripheral statistics. The soon-to-be 31-year-old has a career 2.85 ERA against a 4.68 xFIP. The latter statistic normalizes a pitcher’s homer/fly ball ratio as a method of estimating a pitcher’s true run-prevention skills, but it doesn’t account for the fact that many of Buchter’s fly balls are actually infield pop-ups, which go for outs nearly 100% of the time. Over the past two seasons combined, Buchter’s 16.7% infield fly ball rate (IFFB) ranks 10th in the majors among qualified relievers. He also ranks 14th during that span with a 26% soft contact rate against. Buchter is even tougher against lefties, limiting them to a .160/.255/.306 batting line during his MLB career. The late-blooming Buchter spent a whopping eight seasons in the minors before finally making his debut with the Braves in 2014, and was shuffled through the Triple-A affiliates of the Dodgers and Cubs before finally latching on in the majors with the Padres in 2016. Interestingly, the A’s were reportedly competing with the Padres for his services as a MiLB free agent. As for Moss, 34, he’ll return to the team with which he broke out in 2012. That’s just about the only clarity surrounding his presence in Oakland, however. Athletics GM David Forst has already told him that it’s not clear how he fits on the roster (per Susan Slusser of the San Francisco Chronicle). With young phenom Matt Olson earmarked for the first base job and Khris Davis likely to assume full-time DH duties, the declining Moss doesn’t have a clear path to everyday at-bats. His sub-replacement-level 2017 performance (.207/.279/.428) was a far cry from his peak years in Oakland during which he slugged 76 homers and put up a .844 OPS across 1,381 plate appearances. Hahn’s had a roller coaster career. The right-hander showed great promise early on, posting a 3.07 ERA and 3.59 xFIP across 12 starts following his major-league debut with the Padres in 2014. Prior to the 2015 season, he was shipped to Oakland in the Derek Norris trade, and continued to impress with a 3.35 ERA and 52.6% ground ball rate through the first day of July. However, a flexor tendon injury sidelined him for the rest of the season, and although he’s shown flashes of brilliance since, he’s not yet been able to maintain good numbers over the course of a full season. Hahn’s posted a 5.59 ERA with a 6.05 K/9 and 3.57 BB/9 across 23 games (22 starts) across the past two years while battling a number of injuries. Fillmyer, 23, started 29 games for Oakland’s Double-A affiliate last season while pitching to a 3.49 ERA. MLB Pipeline considered him to be the team’s 18th-best prospect in 2017, noting his quick arm and a fastball that can reach 96MPH with good sinking action. Though his control and command took a step backwards last season, their report suggests that he can become a back-end starter at the MLB level. Fillmyer was selected by the A’s in the fifth round of the 2014 draft. 6:16pm: Kansas City will pay for Wood both this year and next, per Dennis Lin of the San Diego Union-Tribune (via Twitter). The buyout will be split in half if it is paid, MLB.com’s AJ Cassavell adds on Twitter. 5:24pm: The Royals have announced an interesting trade with the Padres involving a whole host of pitchers, as Robert Murray of Fan Rag has first reported on Twitter. Kansas City will add starter Trevor Cahill, righty reliever Brandon Maurer, and southpaw Ryan Buchter. In exchange, the Pads will pick up southpaws Matt Strahm and Travis Wood along with infield prospect Esteury Ruiz. For Kansas City, the move represents an effort to bolster the team’s pitching staff down the stretch — and confirms that the club isn’t planning on dealing away its pending free agents before the deadline. The Royals designated Al Alburquerque and Luke Farrell to open roster space, while lefty Brian Flynn was recalled to the active roster while the team awaits its new hurlers. The rotation was clearly in need of improvement, and Cahill has tantalized this year with a career-high 12.8% swinging-strike rate while working exclusively from the rotation. While he has thrown just 61 innings over 11 starts, owing to a DL stint for a shoulder injury, Cahill owns a 3.69 ERA with 10.6 K/9 against 3.5 BB/9 along with an excellent 56.8% groundball rate. Whether Cahill can maintain that kind of production down the stretch is anyone’s guess. But with relatively few appealing rental starters available, there weren’t many other places to turn. And Cahill is making just $1.75MM on the year, so he’s as affordable as rental players come. Both of the Royals’ new bullpen pieces are also affordable — and, in their cases, controllable. Maurer, 27, is earning $1.9MM this year with two more arb campaigns yet to go. While the results haven’t been there for him in some time, he is carrying impressive peripherals this year (8.7 K/9 against 1.8 BB/9) to go with his upper-nineties fastball. Buchter is arguably the most valuable asset going to K.C. He is already thirty years old, but can be controlled all the way through 2021. The southpaw carries a 2.93 ERA since landing in San Diego, with 11.1 K/9 on the basis of a swinging-strike rate that’s up to 11.1% this year. While he issues too many walks (4.4 BB/9 overall) and has been a bit homer-prone (1.64 per nine) this year, Buchter looks to be a quality pen piece at a bargain price. On the other side of the ledger, the Friars have evidently gotten an early start on their winter shopping by adding Wood. Like Cahill (along with current Padre southpaw Clayton Richard), Wood is a recent Cubs hurler who can work out of the rotation or the pen. The results haven’t been there this year — he carries a 6.91 ERA with 6.3 K/9 and 4.3 BB/9 — but there’s some obvious bounceback potential. While Wood’s contract ($4MM this year, $6.5MM next, and a $1MM buyout on a $8MM mutual option for the 2019 season) was under water, Kansas City will be picking up the tab through the end of 2018. Clearly, then, the focus for San Diego was on the other two players added today. Strahm is out for the year after surgery for a torn patellar tendon and didn’t produce great results this year when healthy, but he was generally viewed as the Royals’ top prospect entering the season. The Padres have shown a willingness to take on injury risks in the past, and probably aren’t overly concerned with Strahm’s knee injury. He could open the 2018 season in the rotation or be utilized as a replacement for Buchter in the bullpen. And then there’s the true wild card, the 18-year-old Ruiz, whose inclusion perhaps best explains this swap from the Padres’ perspective. As Ben Badler of Baseball America wrote earlier this year (subscription required and recommended), the middle infield has shown flashes of real potential of late, blossoming after his unheralded international signing. He has mashed in the Arizona League in 2017, slashing .419/.440/.779 (albeit with twenty strikeouts and just four walks) over 91 plate appearances. The Dodgers have real interest in pursuing free agent reliever Aroldis Chapman, Andy McCullough suggests (Twitter links). While we’ve heard plenty of indication that the organization also intends to make a bid on its own departing closer, Kenley Jansen, it appears that the fireballing lefty also represents a viable target for one of the game’s biggest spenders — despite the fact that the club jettisoned a deal to acquire Chapman last winter when domestic violence allegations arose. While Los Angeles has spent very little on its bullpen since hiring Andrew Friedman to run its baseball operations, the club obviously saw the value of a shut-down arm while leaning heavily on Jansen during the postseason. The big question remains just how hard the Dodgers will push, but their presence in the market for the two best-available relievers is certainly a boon for the earning power of both. Meanwhile, the Cubs are giving signals that they may be less inclined to pay top dollar for an established relief arm, as Patrick Mooney of CSN Chicago reports. While the organization gave up a haul for Chapman at the trade deadline, and featured him frequently en route to a World Series win, Chicago would seemingly prefer to think outside the box to find its next dominant relief arm. GM Jed Hoyer spoke of a “targeted” approach to the roster, with the club set to “explore every avenue” in finding a replacement for Chapman. He cited two prominent examples of pitchers who failed as starters but later emerged in a late-inning role. “You never know who that guy’s going to be,” said Hoyer. “If you stop thinking that way, you have no chance to find that guy. You always want to think like: ’OK, who is going to be that next Andrew Miller? Who’s going to be that next Wade Davis? '” As Mooney notes, Carl Edwards Jr. represents a possible internal option to take high-leverage opportunities, along with former closer Hector Rondon. Beyond that, Hoyer says, the team will “be looking at a lot of ways to acquire pitching” and will “explore every avenue” to add arms this winter. That somewhat unconventional approach has long been pursued by the Pirates, and Travis Sawchik of the Pittsburgh Tribune-Review looks at the team’s rotation prospects this winter. Pittsburgh’s reclamation strategy has paid dividends time and again, but that may be tougher than ever with a thin market and perhaps added competition from other organizations who have seen how the Bucs’ approach can work. GM Neal Huntington emphasized that, while a veteran pitcher would “take some pressure off,” it remains hard for his small-budget organization to commit the years and dollars needed to compete on the open market. He stressed the need to continue pushing the development of the team’s homegrown starters, and certainly there are a variety of options already on hand, as MLBTR’s Charlie Wilmoth analyzed in taking stock of the Pirates’ offseason outlook. As he notes, and Huntington acknowledges, the club could consider bolstering that group by dealing from its fairly robust array of position-player talent. The Padres optioned left-handed reliever Ryan Buchter to Triple-A El Paso on Saturday, according to Carlos Collazo of MLB.com. The 29-year-old rookie has been a highly productive part of the Friars’ bullpen this season, but they sent him down amid concerns about fatigue and a decline in spin rate. Buchter has relied almost exclusively on his fastball, which FanGraphs’ Eno Sarris wrote earlier this month has been among the best of its kind in terms of spin rate. 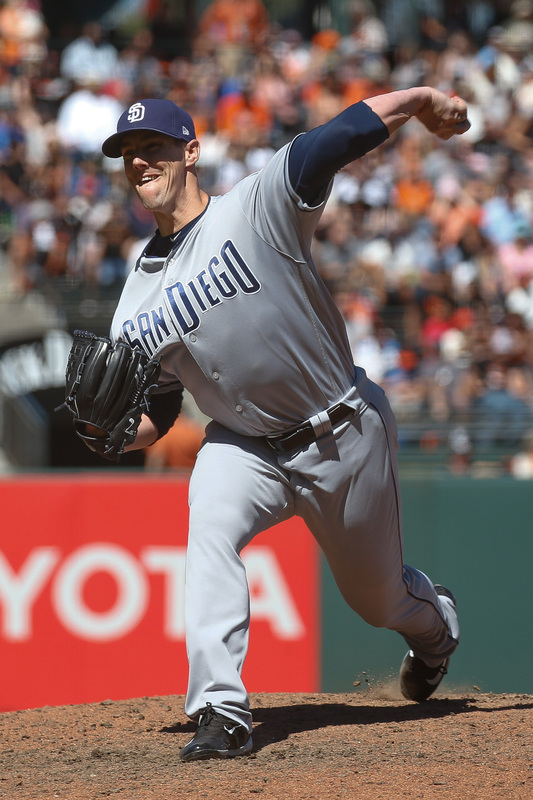 Prior to Thursday, Buchter had worked 11 straight scoreless appearances and, along with fellow southpaw Brad Hand, served as one of the Padres’ top relievers in 2016. He then pitched in each of San Diego’s previous two games and allowed earned runs in both outings. Buchter recorded just one out Friday and surrendered two runs on a hit and a pair of walks. Still, the offseason minor league signing has been a significant steal for the Padres, with whom he has recorded a 3.00 ERA, 11.33 K/9 and 4.5 BB/9 across 54 innings. While the longtime minor leaguer is worst among all qualified relievers in ground-ball percentage (19.5), he has offset that to a degree with a quality infield fly rate (14.9 percent). 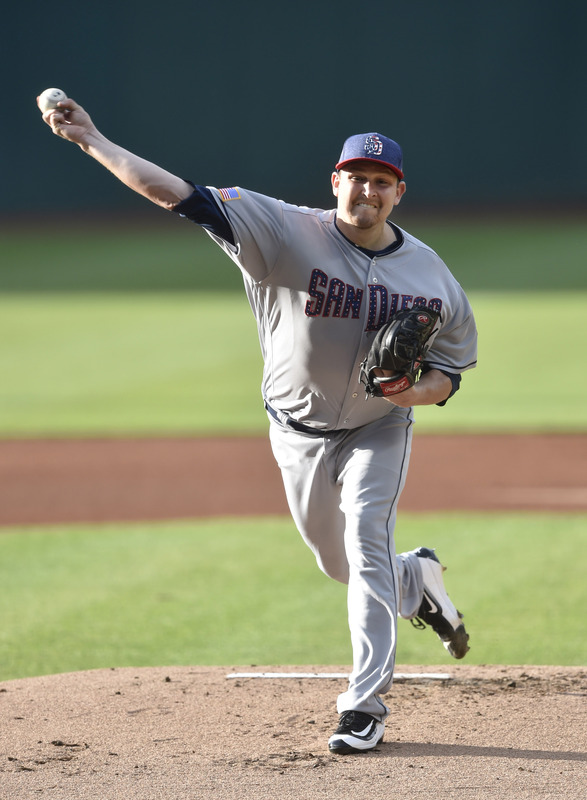 With Buchter headed back to the minors, where he pitched with a handful of different organizations from 2006-15, the Padres have recalled fellow southpaw reliever Keith Hessler to take his place in their bullpen. However, Buchter still seems to figure prominently into their plans at the major league level.